Judging by the Cover – 12/12/18 new releases – AiPT! Chris and Eric share their favorite covers from the week’s new comics. In that spirit, here are the covers that captured contributor Chris Hassan and Manga Editor Eric Cline’s attention this week. While this “Fantastic Four Villains Variant” cover has nothing to do with the contents of this comic–AGHHH!!! Cease your incessant prattling, Hassan, for henceforth, Doom shall do the talking. “Variant cover”? BAH! All covers are variants when Doom’s visage graces a comic book. It is a pity, however, to see Doom on the insipid wall-crawler’s title. Far more fitting would it be for Doom to appear on the cover of the Fantastic Four’s monthly series. Maybe then, Reed Richards and his brood would realize it is Doom who reigns supreme. Ow…my head. (Why does this keep happening to me?) I think Doom’s gone, so I can get back to judging some covers. Oh, well this one’s a nice distraction from the Doom blast to my head. Some of the best X-Men stories are the ones where we get to see them trying to live like normal, everyday people (even though they can never be just that). 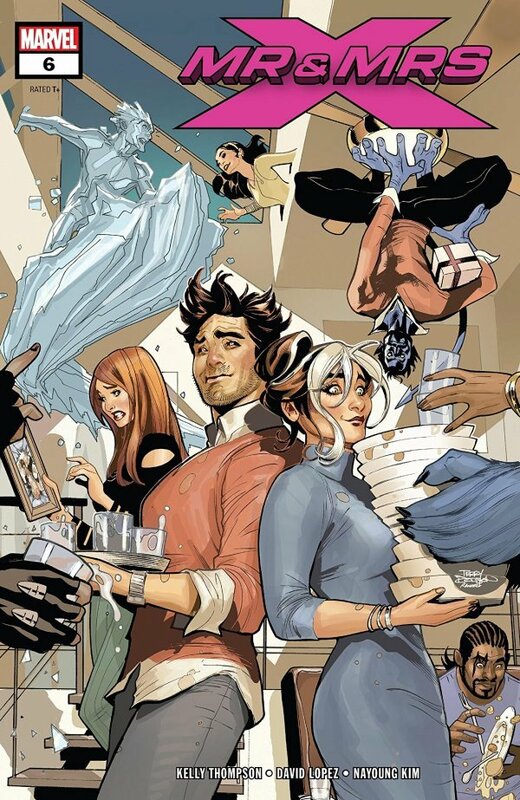 This cover captures the fun of what will surely be a party newlyweds Rogue and Gambit will never forget. I just hope their apartment survives the experience. I’m a big fan of continuity–especially when it’s X-Men continuity. You know, because I’ve only spent the past 20+ years following Marvel’s wacky mutants…NBD! Anyway, when I saw this cover it immediately brought me back to the now long-extinct Waldenbooks where I first saw the cover of Uncanny X-Men #319 (which this new cover pays homage to) sitting on a shelf. I love that the current X-books are being crafted by creators who look back on the ’90s (when I first started reading X-Men comics) with such fondness. 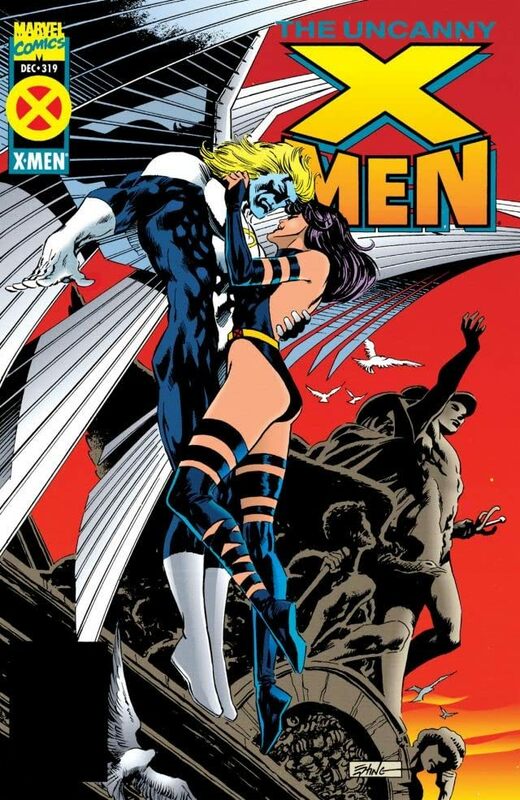 Here’s hoping they also bring back the Archangel/Psylocke romance, which was such a big part of those stories I remember from the mid-’90s. The recent outer space run of Black Panther has surprised on many fronts, one of which being its inclusion of the M’Kraan Crystal. This cover is just plain sci-fi fun, with T’Challa holding the crystal up with all its power on display. The composition, with various important figures from the series, is also well-done. The whole thing is very beautifully painted and just plain pleasing to look at. This is super cute. It’s always nice to see superheroes, especially the X-Men, just doing mundane activities and being actual people. Of course, there are still some charming hints at how chaotic even a “normal” day with the X-Men is. With Iceman sliding around and people sticking out of walls, you never know what’s going to happen next. Redlands covers are always quite lovely. The technical skill on display here is great, from the folds of the fabric to the interplay of light and shadow. Of course, the most striking aspect of this image is the dog–what an expression!